A great gift idea for the kids is the all time favourite tabletop football game which (once the rowing is over between siblings) can provide hours of fun and competition type challenges. I’m going to review the table football game I bought for the kids in the hope of being able to close the conservatory door and get on my xbox for a bit of peace and quiet whilst they hammered it out kicking the ball around trying to win the championship league! Not so, I ended up playing it myself and I don’t really even follow football. What was I looking for when choosing the right football game with its own table? Well really the main consideration was the size of the actual footprint from the table. Room is fairly limited – but there is enough for one of around 4ft in length, which I felt was about the right size. There are smaller ones, but I wanted “robust” as I know what the boys are like, once the match starts it’s full on concentration and bouncing round the room as the goals are scored and the rods would be bound to take a lot of hard hitting twists and shoves. So with size, I felt comes a stronger build (typically). Secondly I really wanted one on which the players were painted in different football kits with regards their colours, say one in blue and one in red, because where I come from the teams to support are primarily either Manchester United or Manchester City football clubs! I wasn’t too bothered about the details of the individual players, but a bit of team colour coding would be ideal. Next up I considered the tabletop games which folded away. Now I may be wrong, but I just had a gut feeling that they would be more “wobbly” than a fixed tabletop football setup, granted I would have to suffer the loss of the room space, but if it keeps the kids happy its worth it. 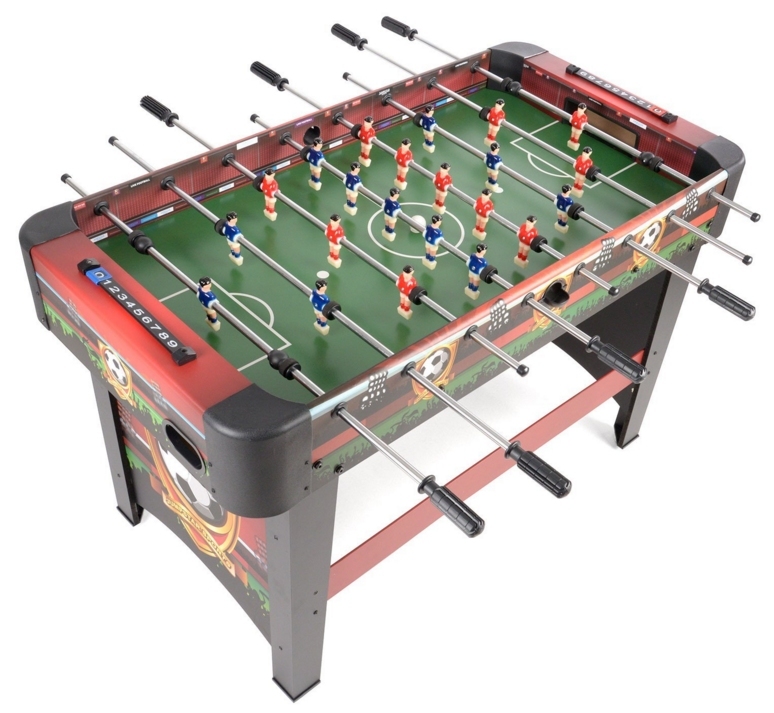 Also available are the combination games tables, some of which seem to incorporate around 30 different game types including football, air hockey, pool, snooker and a host of other sports in addition to the more traditional games such as chess. I discounted these and scrubbed them from my list because the quality of the games seemed to lessen as the tables built in more and more options. Price is also a factor to consider, I’m not stingy, but the more glamorous tables with chromium international football players and floodlit stadiums were more aligned to the grown up kids market – those (I decided) were more for the die hard football fans out there who might bring their friends round to watch a match on Sky Sports before having their own following a few cans! So after a fair amount of deliberation I went for the one shown below. 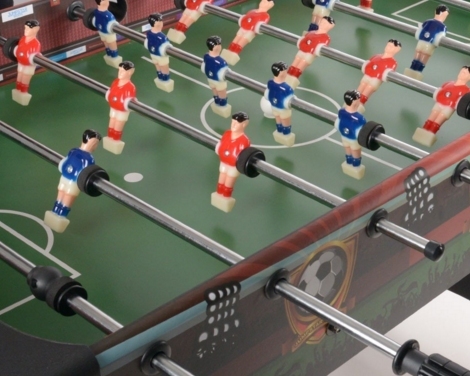 The tabletop football game itself is 4 feet long and 2 feet wide and 2 feet six inches high. There are the standard 8 handles fixed to their rods, each of which controls a set number of football players depending on the position on the football pitch. At either end of the stadium there is a sliding marker scoreboard to track the goals (essential for feuding boys to keep score). Take a look at the teams players – each has their own style of kit in red or blue and to top it off they have shorts and even hair. I say this because on some table top football setups they are bland without any distinction beyond the overall colour and basic shape – these are quite well designed. There is a slot at each end of the table, the ball emerges there following a goal and then is rolled back into play via the receptors in the middle of the table (one on each side). The football pitch itself is actually curved in each corner, this ensures as much as possible that the ball never comes to rest out of reach of the players’ boots. The goal keeper of each team is prevented from moving outside of his box by two extra stoppers on the bar – which – if you feel generous could be removed so you have the choice. Each of the rods has a firm handle grip and is padded by two washers and a sponge to prevent it hitting the tabletop too hard during fervent gameplay! The table legs are rock solid, and on the base of each leg is an adjustable threaded pad which enables leveling the table if the floor is that bit uneven. there are eleven players per team positioned in striking, forward and defensive positions around the pitch. If you want to re-arrange these then it is possible to an extent by switching the rods around. However there are pre-drilled holes to fix the players so without further drilling you are limited. I think its fine as it is. Building this Tabletop Football Game. I won’t deny this, it was tough. There are a lot of screws and fiddly bits. For example, the players, there are 22 to position, each has 1 nut and one bolt – 66 pieces before we even address the washers, padding and handles. Just remember to slide each football player onto the pole facing the right way. The table is probably as easy to build as it could be. But still, this leaves quite a few parts and getting the pitch to fit into the groove which creates the curvature was not easy. There are self tappers and pre-made holes and a couple of alan key and spanner components to assemble aswell. I am not complaining here – what it is is what it is – but bear in mind there’s quite a bit of work to be completed before you can let the kids loose on it. This is what its all about. Once built the table stands solid and ready to go. 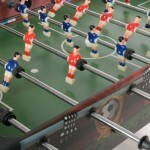 There are three footies with it – kick off is performed by rolling a ball through the side of the table into the center circle. The men can be “spun” like on the tables you get in pubs and clubs, but this is best avoided for a fair game. The action is fast and furious in parts as the players tackle and dribble the ball up and down the pitch trying to score a goal – I have to admit – it gets tense!! There are one or two spots (and this would apply to any table) where the ball becomes unreachable, but this is quite rare and we consider this a throw-in situation. A couple of things could be considered as a foul, such as spinning or maybe lifting the table to encourage the football in a better direction. In this eventuality the penalty comes into play and the ball is placed on the penalty spot marked neatly on the tabletop pitch. Whilst individual games are fantastic fun in their own right, add in the concept of the tournament and you have an ongoing game which needs replaying over and over again. You could even throw in a world cup challenge and take your team to the top!